Fender is an excellent brand known for producing top of the line guitars. Although they are really popular for making great electric guitars, they have become an excellent choice for acoustic guitars too. With so many reasons to love about Fender guitars, we can be assured that we will only getting the best instrument tested through time. So for the Fender FA-100 Acoustic guitar, you’re not only going to pay for the price, but you are going to get a far more excellent entry level guitar that bears the Fender logo on your guitar’s headstock. 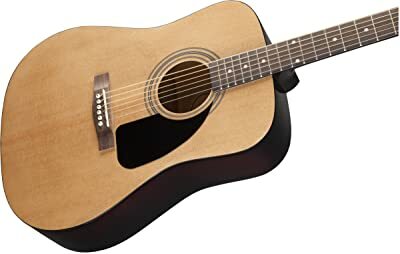 What is the Fender FA-100 Dreadnought made of? 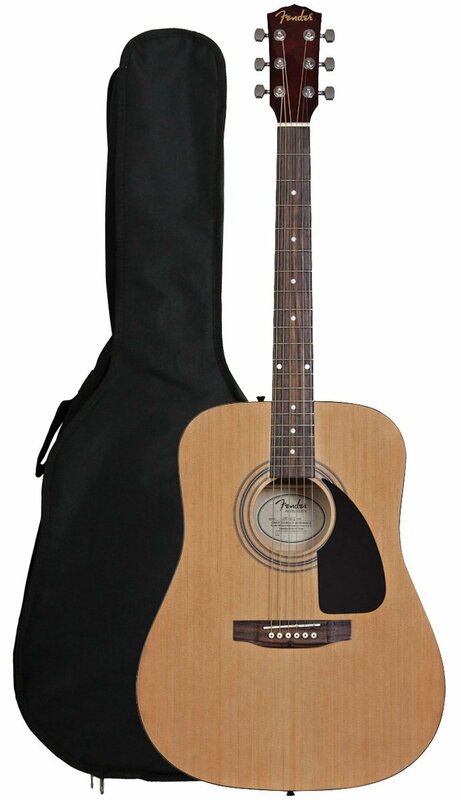 The Fender FA-100 acoustic guitar comes in a classic dreadnought look with a solid spruce top lamination. The sides and back are made of basswood, and the 20 fret fingerboard is made of rosewood which completes the 25.3 inches scale. I am impressed by the classic headstock exclusive for this model, which greatly compliments the whole look of the guitar. I was expecting more from the synthetic bone nut though, but its okay since it will be too much to ask considering its price. The overall finish is impressive too—Fenders are good at that. Additionally, the package includes a few more things aside from the guitar. That is why this makes a sweet deal for your money because it comes with an electric tuner—a delight for the beginners, a padded gig bag, strings, a strap and picks. All these extra items are very handy as you go pro as a guitarist and you get it for free. Truthfully, as a budget friendly, entry level guitar, you shouldn’t expect too much from the FA-100 in terms of sound. However, for anyone with an expert hand for guitars, a switch to a higher quality strings can greatly influence the sound this acoustic guitar makes. However, for most beginner ears, the sound that the FA-100 makes doesn’t sound much different as other higher quality guitar, the reason why this makes a great deal for novice guitar players. Even though buying the Fender FA-100 means sacrificing the sound quality a bit, the sound isn’t too bad and will be satisfying enough for those who have never touched a guitar before. When using the guitar, the FA-100 can be a bit huge in the hands of a youngster. Don’t get discouraged though, because this particular guitar has an easy playability, which makes it appropriate for an entry-level guitar. The basic rule of thumb is that, the closer the strings to the fret, the easier it can be played, and it is one of its best traits of the FA-100. The sad news is that I have read some reviews that say some users complain about some occasional buzzing—which usually happens when the strings accidentally hit the frets. You don’t have to worry though, as these are just minor problems and could easily be fixed. For an entry level guitar, it is expected that the FA-100 has several flaws. As I have said earlier, the sound quality is nice but far from excellent, and requires a lot of tuning as for my experience. Physically, its neck seemed to be quite thicker and I noticed the action was a little bit high. But once it has been adjusted to into a nice set up, it will take you into far distance. Even still, it makes a great deal out of your money. It’s a Fender and you’re guaranteed to get a nice quality instrument, even if I somehow doubt if it can live a few decades like other guitar. Nevertheless, you will learn from it, pass it on to other beginners and upgrade into a better quality acoustic guitar. Overall, Fender guitars have always been known to be of good quality to perform well in different music styles. It just needs some minor tweaks and you will be surprised how rich the sound that it makes. I highly recommend this for beginners as it can go with you through your first few steps towards learning to play the guitar. The guitar feels comfortable, has a nice playability, and the output is clear, rich and smooth after a few tweaks. Basing on its price, the FA-100 is going to be the best deal among other budget guitars. In fact, it is one of the cheapest you’ll ever find that’s worth the purchase (in the least). It carries the Fender quality, lightweight and highly suitable for a beginner. However, if you have some few extra bucks to spend, you’re free to look for other guitars. But with the Fender FA-100, you can get a nice guitar with a few extras on the pack.